We performed this audit at the request of the Atlanta City Council. $7.8 million has already been spent on the project, with $7.5 million of that amount paid to R&D Testing and Drilling to survey the park and replace the soil. The Daniel L. Stanton Park project was halted in August 2001 due to a lack of available funding. The city did not use a competitive selection process or execute a formal contract with its primary contractor, R&D Testing and Drilling, for the Stanton Park project. 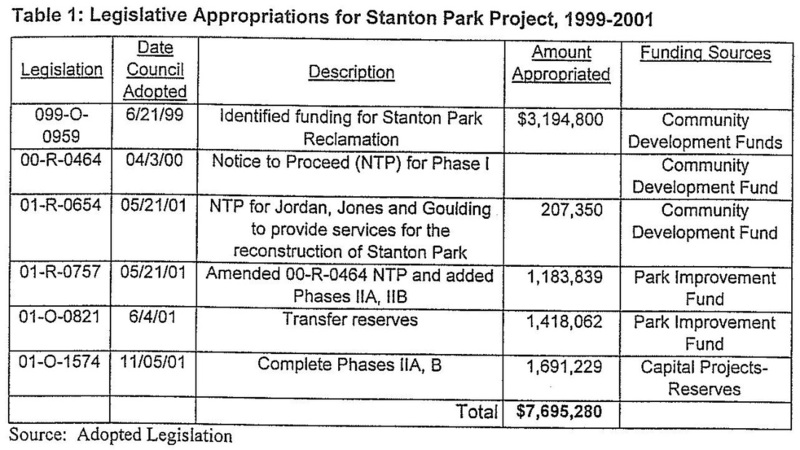 The circumvention of City procurement requirements for the Stanton park project left the City without the protections that a formal contract could have provided. The former Commissioner of Administrative Services handled aspects of the procurement process for the Stanton Park project that are assigned in the City Code to the Director of Purchasing and Real Estate.